This month we took Max (who is 2 next month) on his first holiday abroad - to America. 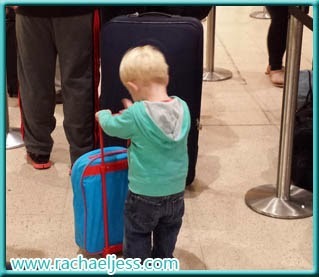 The flights were, on average, 8 hours and through our experience of this here are my top tips on travelling with a 2-year-old ! Be prepared that little ones do not like hanging around in queues and, therefore, it may be a bit of a testing time getting through security and baggage check-in. Not a lot we can do about that really. Silver lining - if your little one kicks right off at immigration in the USA - they'll fast track you to get you the hell out of there! We had an evening flight coming home and Max was much more relaxed. We wore him out during the day, made sure he was properly fed and went to the park an hour before we were due to check in to ensure he had had a good fun packed day. Once the seat belt signs went off - he was out for the count until we landed in London. I know that sounds expensive but it doesn't have to be. We bought a £30 portable DVD player from Tesco. I used my Tesco Clubcard points. This little item was a Godsend throughout the holiday. We did have in-flight movies which did keep Max amused but his eyes lit up when he saw Toy Story on the DVD. The battery life is only 3 hours so time this one well. This is a must. Lots of people will have their pushchairs with them and if you are out for the day sightseeing and your little one falls asleep for their lunchtime kip - you're going have pretty heavy arms by the end of the day - only for them to do it again tomorrow. So even if they hardly ever use it at home - it's better to have it and not need. If your little one plays up or kicks off - only those in rows behind and in front can really hear him. Most will have headphones on and those further back won't hear your little one as the sound of aircraft is pretty loud too! - And at the end of the day - keep in mind you won't see these people again, and those with kids will understand. Most importantly - once you land and out of the airport - ENJOY your holiday!